The Life and Times of a Bulk LEGO Lot. Regardless of whether you get instructions or not with a lot like this one (completely mixed) I use the same techniques to figure out what sets I have. I will start sorting a bulk lot as I wash it, sometimes before. The most effective way to tell what you have (unless you have the instructions) is to know your mini figures. With my first run through I pull out every mini figure and mini figure part I find. Say hello to Ten Numb, he was one of the first figures I found and he is only in set 6208. Looks like I have a B-Wing. Stickers are the next method I use to identify sets. Some like a license plate will actually give you the set number. Same goes with printed tiles. A quick note about stickers, they HATE to be washed. I will try and pull any piece out that has a sticker on it before washing. Washed or not as I find pieces with stickers or printing I sort them into a tray. The same goes for any unusual pieces, as I find them I set them aside in trays or boxes depending on how big the lot happens to be. I will also sort out some of the more common bricks and plates by size and shape, while I don't generally sort by color if you find it helpful by all means do so. An average tray of sorted plates looks like this. Makes your pile smaller and whenever you need a plate of any size you know where it is. I will do the same with bricks, rounds, smalls, and all the other more common pieces. When I am done I will always have a few pounds of random unsorted pieces that don't seem to fit in with anything. With those I just put them in a box and dig through it as needed. Sometimes, even with a lot as random as this one, you luck out and will find pieces of sets or even ones that are near complete. It's not something that happens all the time but it's worth mentioning. Just be alert, for every chunk of a set that I have found I've also run across two or three altered sets or flat out MOCs. 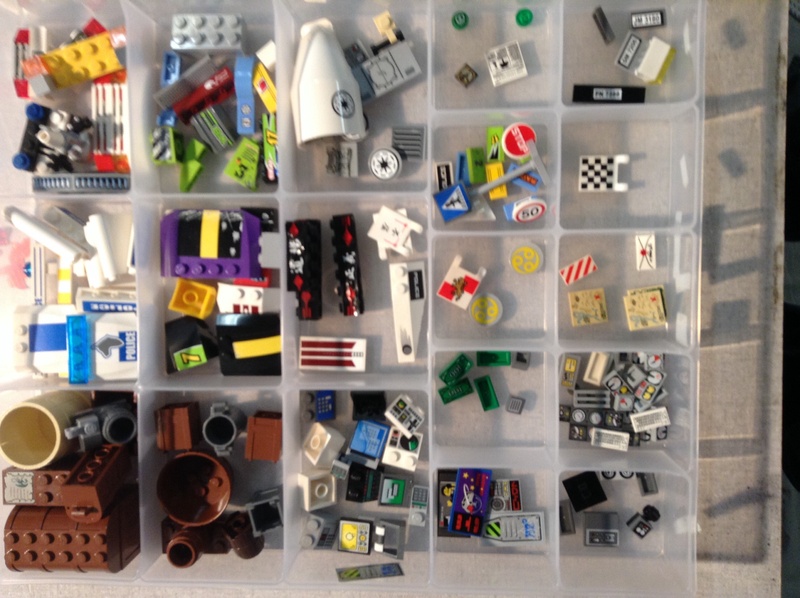 Anyone who has ever processed a bulk lot will know that they always come with non Lego. 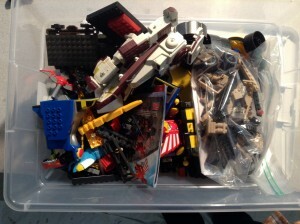 As I'm sorting anything that I don't think is Lego goes in its own box. Saving non Lego was a painful lesson to learn. 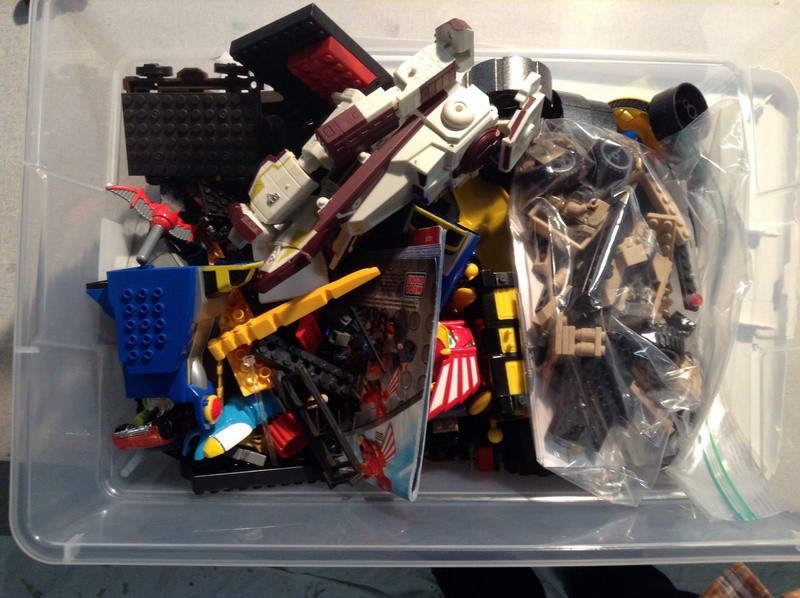 While sorting one of my first bulk lots I took a quick look at the head to the creature from 7255, and thinking "no Lego looks like this" tossed it in the recycling bin. Oops. At least I could still sell Grievous. 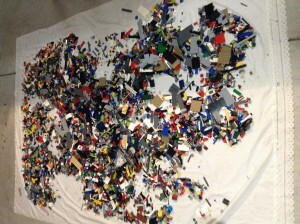 So, trust me, keep your non Lego until you're done with the lot. I have always found it difficult to wait to start building so while I'm sorting a lot I tend to start assembling sets. I'll even work on several at once, I keep each one in their own box as I go. 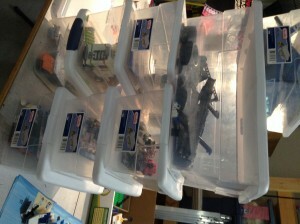 I got all the bins from one of the nicer lots that I purchased, each set was in its own bin with its instructions. That has only happened once so don't expect it to be the norm. And I have no idea why this pic seems to be sideways. Great article! 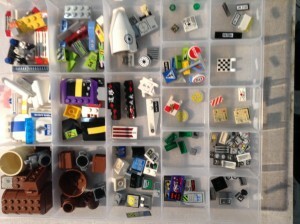 I find myself using many of these strategies when I am working on a bulk lot of Lego, especially working on several different sets at the same time. Working on multiple sets started as a way to avoid getting burned out. It's funny though, if I'm having a hard time finding a certain piece I've found that by working on a different set I'll quickly find what I was originally looking for. I also will skip a hard to find piece and work ahead on a set until it either turns up or I have to bricklink it. Great strategy. I found myself in that situation many times before. Right now, I'm working on about 5 sets right now and using this strategy has helped speed the process of putting together sets. Enjoyed tis blog. I am new to all thid. Just lucked out on my first garage sale buy..may have to see what sets i migt have. I was just going tobuse them for mocs and maybe bulk ebay sales. Always enjoy reading a blog about bulk lots. I'm still trying to get through my first bulk lot purchase, but almost done. It's hard to find a good price for bulk where I live as there seems to be a lot of AFOLs! Thanks, I will sell complete/near complete sets first, then MOC, then sell bulk. The lot in the pictures is basically done now, just pulling out the odd piece for a boat that I'm working on. Thanks. I think the price issue is a problem everywhere, and it will only get worse as more people get into this. Have fun playing with your Lego...er processing that bulk lot and good luck. Nice article. 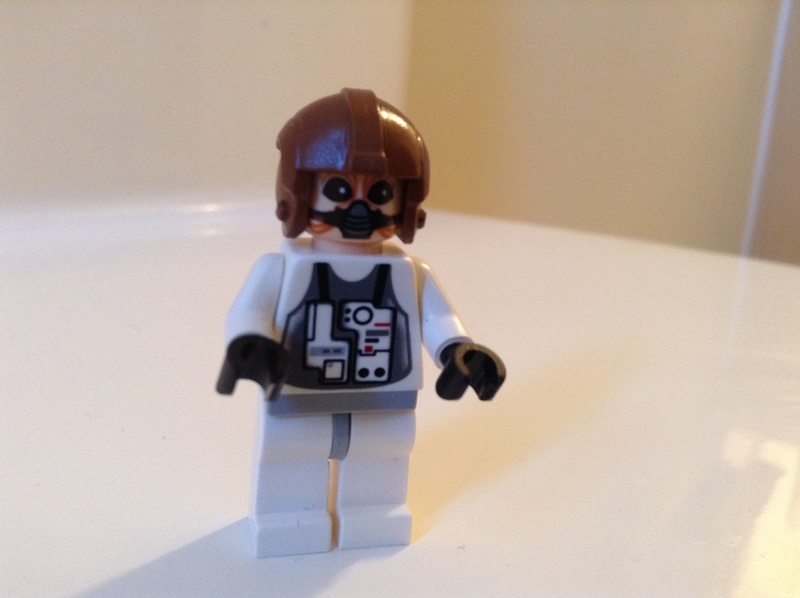 Do you use an inventory part list to just run through and pick pieces for sets once you've identified a minifigure or unique part? Or do you build them using the instructions? I have done both and by building it I get to take a pic of the actual set before selling it (plus get a build experience if it's a cool set), so i usually do that now. Found inventory lists hard work to keep the interest level up, but it's probably more efficient time wise. I build the set. I think having a photo of the set complete helps the item sell. And what's the point of having a bunch of loose sets if you don't get to build them? Also by building large numbers of sets you get a feel for how sets are designed, it makes MOCs turn out better even without using any software. Haven't used those websites yet, but I will be sure to check them out, thanks. It took me about 6 months or so to be able to "see" what was in a lot. Just something that comes with experience I suppose. I do enjoy finding lots that are older than what I normally deal with, makes it more of a challenge with sets that I don't see all the time, in a good way. I feel your pain with the color ID thing, my first Bricklink order I ordered dark gray instead of dark blue gray, they look nothing alike when seen side by side. Good luck with your treasure hunt. I know the feeling with throwing out LEGO you thought was non lego. Just bought a $25 ball for the temple escape because I threw it away. OUCH. And kids are great when you can't find a certain pieces....their little eyes see everything! Looks like our processes are similar except that I sort by color instead of by piece type. Fun times! I think just about anyone that deals with bulk on a regular basis will arrive at a similar process eventually. I tried sorting by color for a bit, but my eyes had a harder time picking out the pieces that I wanted. Really the only "Right" method is what ever works best for you. I would have sold my current lot by weight long ago, but my son keeps building $10 sets out of it. So I keep selling them, it's to the point where he's the only one working on them. Now I am obligated to pay him for his work, so his new "chore" is building Lego sets. I have been lucky with my lot (about a 49 gallon tub and another 15 gallon tub) that they are all old gray. Breaking those out would be miserable. 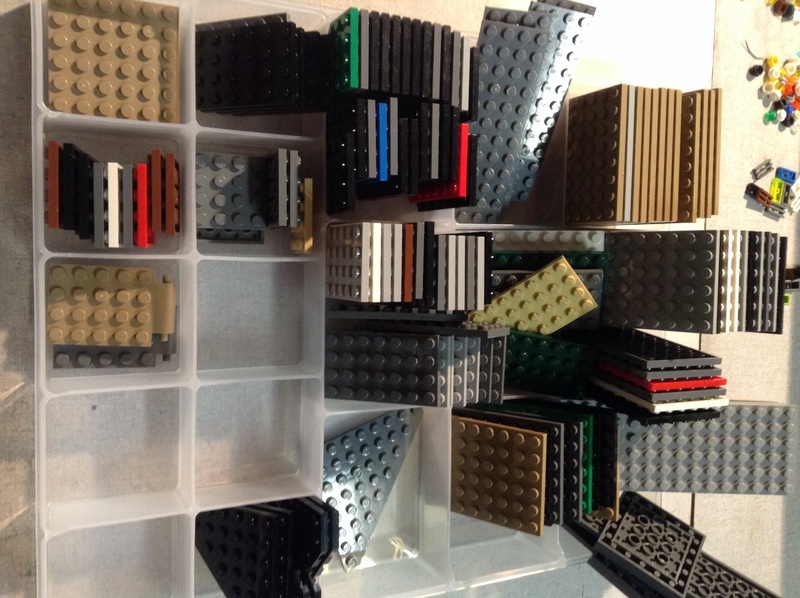 I did have a good load of mega blocks, BTR, and other brick based systems that is rather tedious especially for the specialty pieces mentioned. It has been great fun though.